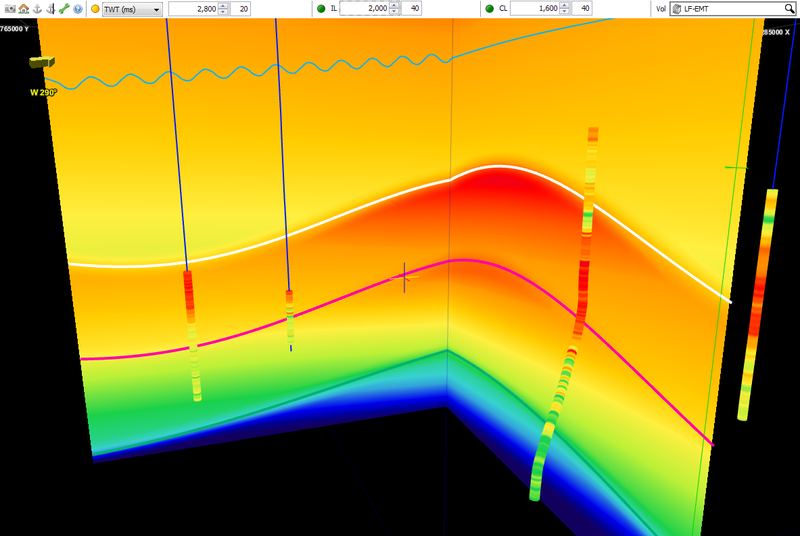 Description Construct layered P-Impedance, S-Impedance, Density and optionally Vp/Vs models from lithology trends. The LF (Low Frequency) Model: End Member Trends process constructs P-Impedance, S-Impedance, density and optionally Vp/Vs volumes using lithology trends. 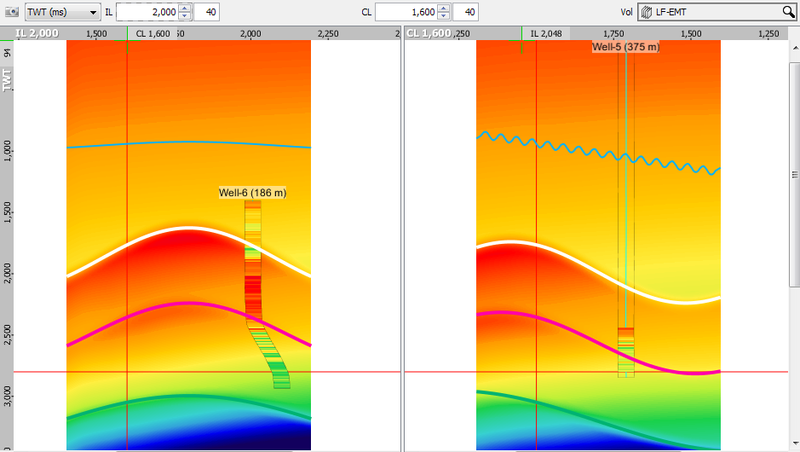 The resulting models are useful for forward modelling investigations and as inputs for seismic inversion. Because lithology trends are calculated from depth below mudline (water bottom), a velocity model and water depth information must be provided. The structural behaviour of the model is controlled using a windowing model (see Creating a Windowing Model). 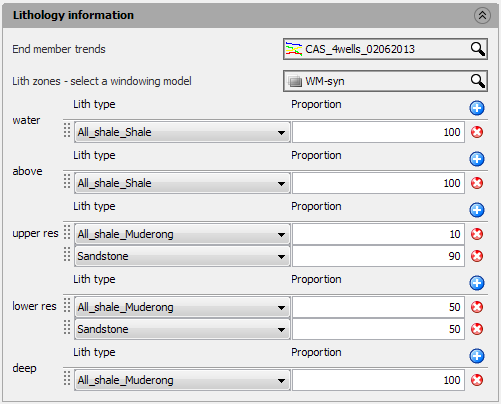 Each layer of the window model is populated by calculating the rock properties of the specified lithology as it varies with depth. When more than one lithology is specified for a layer, the combined rock properties are calculated with the assumption that lithologies are thinly laminated and evenly distributed. Scroll down and double-click LF Model (End Member Trends). In the Details Panel, select whether to use a Constant or Horizon to define the Water bottom. If a horizon is chosen, you can optionally input a constant to offset the horizon. Select the Include Vp/Vs in output? check box to generate a Vp/Vs volume as part of the process output. Survey — Select a survey to be used in the process. Inline extent — Type the range of inline extent and sample interval for the low-frequency (end member trends) model. Crossline extent — Type the range of crossline extent and sample interval for the low-frequency (end member trends) model. TWT/TVDSS — Type the time/depth extent and sample interval for the low-frequency (end member trends) model. End member trends — Supply end member trends to create the output volumes based on the trends. Lith zones - select a windowing model — Select the windowing model to use in the modeling (see Creating a Windowing Model). A combination of lithology types can be specified at each layer of the input windowing model, and type the proportion of each type in the corresponding box. As a result of this process, new End Member volumes are available in the Volume tab. If you have selected to generate the Vp/Vs volume as an output in the process, the VpVs volume will also be available in the Volume tab. To quickly open the output volume, right-click the process item in the Process tab and click Open Child Volume. Vice versa, the process can be opened from the Volume tab directly. To do this, right-click the volume which was created from a process (indicated in italics) and click Open Parent Process. Note: The model will be created natively in depth, but it can be converted to TWT before being output if a Time/Depth conversion velocity is supplied in the session.